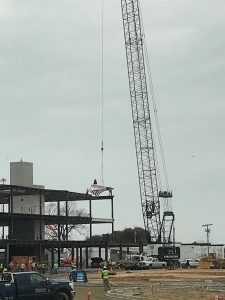 The final steel beam has been installed for the Inspira Health Leading-Edge Cancer Center in Mullica Hill. The building will be an attached addition to the future 465,000-square-foot Mullica Hill hospital building. Both facilities are being constructed by Skanska USA, of Blue Bell, Pa. The new hospital building is slated to open this fall while the $70 million cancer center is projected to open in January 2020. The cancer center building will be approximately 120,000 square feet and include several suites devoted to non-cancer-related clinical and office functions including cardiac rehab, physical therapy and other rehab services, women’s imaging, maternal fetal medicine, pediatrics, OB/GYN, urology, orthopedics, preadmission testing, lab draw services, and an Inspira retail pharmacy. An event commemorating the event included remarks by M. Todd Way, executive vice president of operations, Inspira Health; John DiAngelo, president and chief executive officer, Inspira Health; Michael McLaughlin, chairman of Inspira Health Board; Gary Galloway, chairman of Inspira Hospital Board; Dr. Carl Minniti, medical director of Inspira Medical Center Woodbury Cancer Program; and Senate President Stephen Sweeney, D-3rd District. Array Architects and TLC Engineers serve as designers for the project.